Many AWCO clients provide container drayage services to assist customers in importing and exporting goods between ships from international travel and railways for domestic redistribution. Freight forwarding moves your items from one mode of transport to the next leg of travel, either out of or into port or between rail lines. Our clients move your products carefully between harbors and rail ramps to maintain their integrity and packaging before their next journey. Our clients pick up or drop off your materials to their forwarding location and are equipped to handle many varieties of freight. Generally products and materials are moved locally with 20 ft. and 40 ft. ocean containers and moved between rail cars and freight ships. 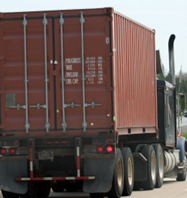 Our clients offer competitive pricing and availability to any port or railway in the U.S. or Canada. To find out more about container drayage services and freight forwarding, contact us today. We will include drayage rates with your warehousing quotes to compare with your current drayage provider.